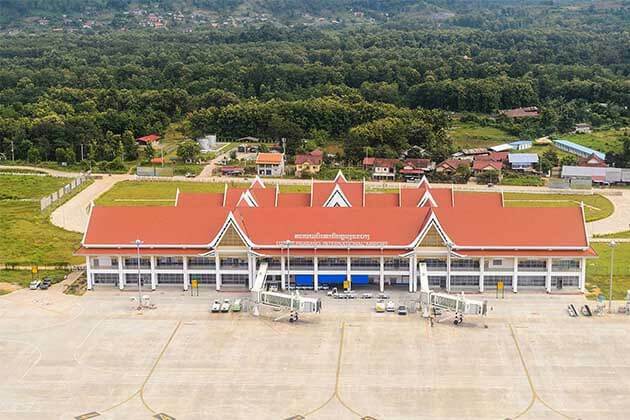 If you are finding a special trip in Laos, neither Vientiane nor Luang Prabang, now, we lead you to the new land in Laos, Phongsaly which will make an unforgettable voyage for you. Although the journey has a little intrepid, it brings richly rewarding. On your day tour, you'll have a chance to meet the exotic hill tribes living amid spectacular natural landscapes. 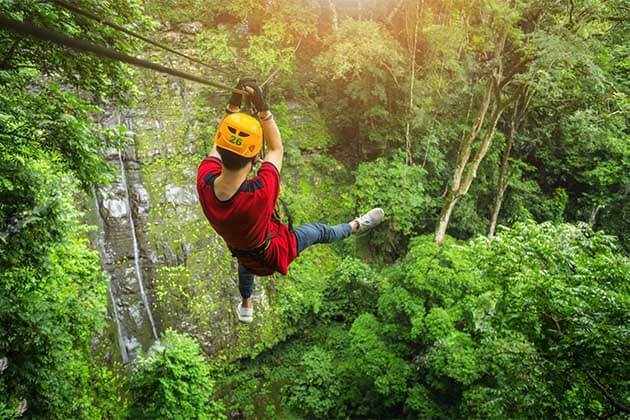 This tour is suitable for anyone who has a passion with adventurous treks then you can relax with a cruise on the scenic Nam Ou river. 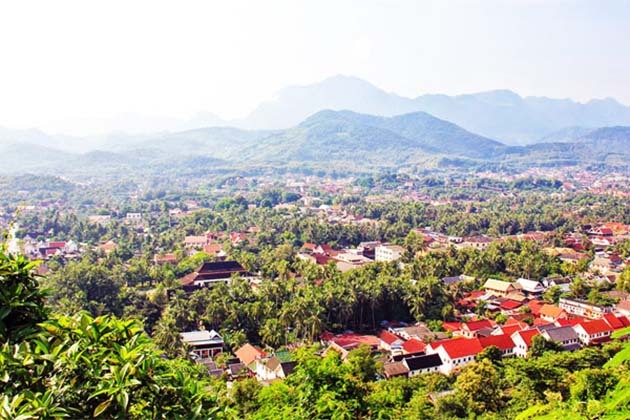 Welcome to visit the ancient town, Luang Prabang, upon your arrival to Luang Prabang, our guide and driver are waiting for you to transfer to your hotel for checking in. Have a rest before exploring the town, it’s your time to walk around the city. After breakfast, we will depart on a Mekong river cruise for the small town of Pakbeng. On the way, enjoy lunch on board. 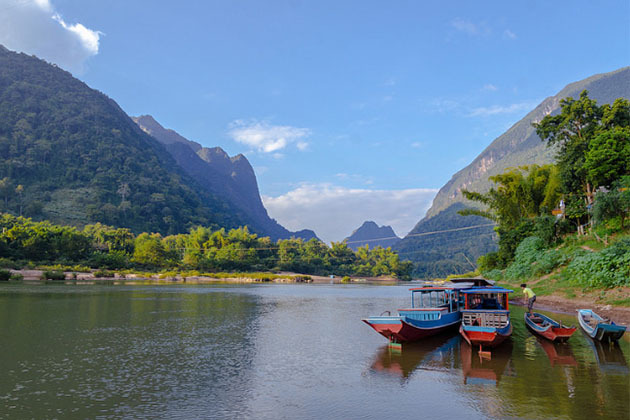 Although It takes about 8 hours on the boat, you can enjoy the stunning scenery, the villages along to the river bank, or the local people go to fishing, mix to the light wind, float on the river, whatever is more interesting, so, time is not a matter. Arrive into Pakbeng town around 16:00. 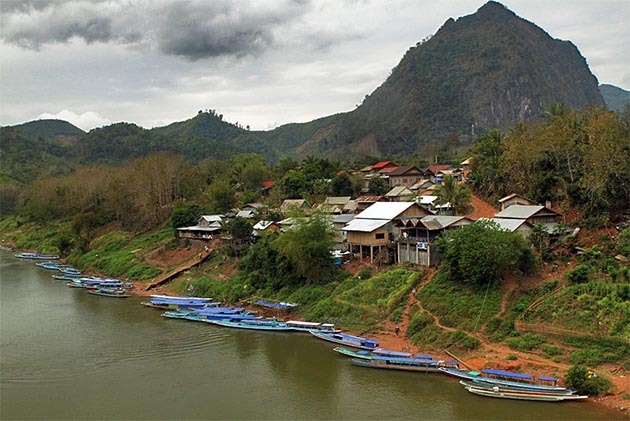 Acting as the link between Luang Prabang and HouyXay, Pakbeng proves to be the ideal stop for low boats spanning the two distances. Step into the village, in front of you, it is the dynamic town which is illustrated with wooden houses along a steep street on the hillside, exuding tranquil, laid back vibe. In the late of the day, don’t miss the amazing moment from the Mekong sunset, Take a lot of pictures to save this moment! 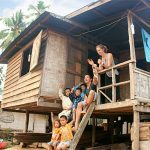 Wake up early in Pakbeng, make a morning visit to the nearby market where residents of the nearby villages and hill tribes gather to buy and exchange their goods. Then, back to your hotel for breakfast before taking a long boat across the river to reach the elephant camp on the opposite side of the Lodge. At the camp, you will receive an introductory tour which the guide will give the information about how the camp working. 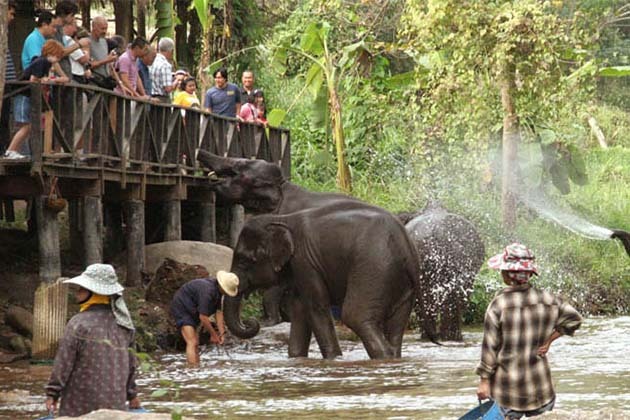 Then, participate in with the elephants’ daily bath, which lasts about 30 minutes. 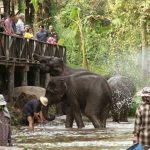 And the camp’s pool is designed to allow 8 elephants to bathe at the same time. After the bathing experience, head back to the boat for a return cruise to the lodge where a delicious local lunch awaits. Make sure that you have full of the stomach before driving to Muang La. On the way, take note of the provincial capital of Oudomxay whilst passing through. In the past, Oudoxay has ever known as a sleepy town, this has become an important trading hub which reflects the rapid changes of the region. In the late afternoon, we stop at the Muang La Resort, check in, relax and enjoy the views. The resort with full facilities such as a spa, sauna, and steam room. Overnight in Muang La Resort. 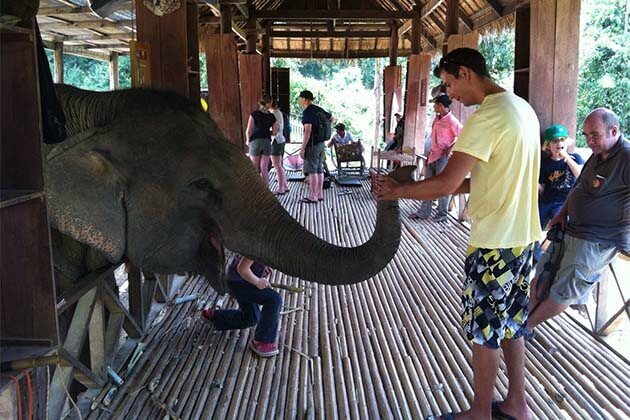 After enjoying the breakfast in the Resort, make a visit to Lao Loum Village. 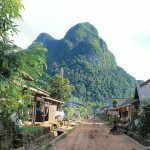 Upon arrival head to the starting point of the walk, trekking through the lush vegetation of northern Laos. Along to the mountain trail for around 30minutes, leading along rivers, hills, mountain streams, and flowing rice fields. During the hike, the guide will explain the life of the local and how they use indigenous plants, herbs, and trees of the forest to feed, and sometimes even heal themselves. Continue to the trip, you will across bamboo bridges to reach the Yang village, walk more than 2 kilometers, you will see a hidden monastery, Wat Hoytinphabath, the temples with a 35m long reclining Buddha. Besides, there are numerous effigies and symbols of the Buddha can be found in the central temple, which is known as the Buddha footprints embedded in stone. Back to the Resort to enjoy lunch. In the afternoon, you can be free at leisure to discover the surrounding or relax at the Resort. 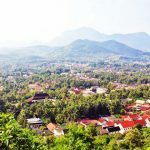 After breakfast, move to Phongsaly, which you misunderstand that Laos is boring, after all, on the way, you will see the beautiful landscapes, local rural, and panoramic mountain views. Don’t be hesitant, stop in the pavement to take a lot of pictures. Continue to the Ban Bountai and stop here for enjoying the picnic lunch. Upon your time, you can visit the local market before going to Phonsaly at 16:30. After checking in your hotel, go down to the street with the guide, you will see the charm of the town made by the narrowly paved streets bordered by traditional Chinese wooden house. On the way to exploring, you will be introduced by guide about the history and culture of this multicultural city and the harmony that reigns between Lao people and Chinese immigrants. Here is also a chance to visit some temples which were designed by the Chinese. In the late afternoon, you can go to visit Wat Keo, the most famous temple in Phongsaly, where you can see the monk play petanque or football in the evening. Breakfast is ready for you before driving to Bountai. 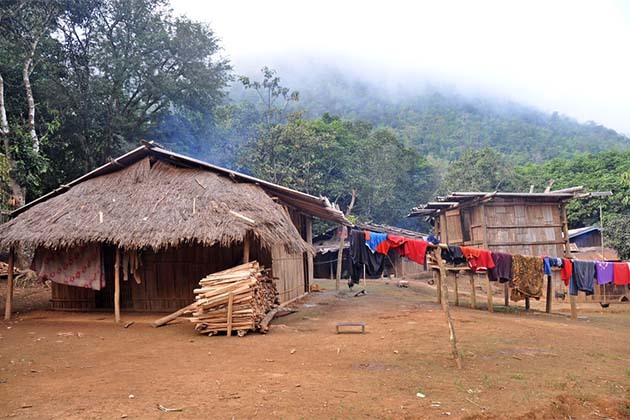 Company with your guide today, we will visit Hmong village of Ban Aya, and start trekking. After meeting the new local friend, we will trek into the nearby jungle and verdant rice fields for some brilliant surrounding landscapes. 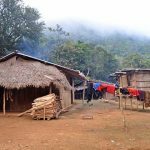 Add more energy for your journey, enjoy a typical Lao picnic lunch before descending to Ban Aneng, another Hmong village to explore the town’s rich culture and traditions. Afterward, let’s go with the guide to visit some villages includes Akha Mouchee, Tai Yag, Laopan and Tai Yue before going back to Bountai by private car. Back to the hotel in Phongsaly, take a rest and your remaining time is free. 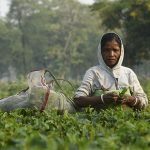 Breakfast is still served for you in the morning, after the meal, we visit the famous 400-year-old tea plantation, located in the village of Ban Komaen. 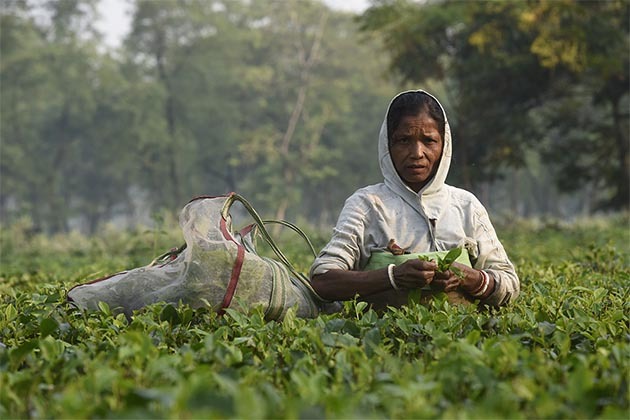 You will have listened about the story of the tea which is known as the oldest tea trees in the world. It’s not amazing when seeing the large root system of the old trees which extends deep into the mineral-rich soil and gives Phongsaly Tea bring a special taste. 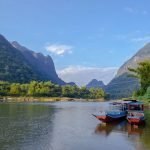 On the road to Ban Komaen, you also drop to the other tea plantations and admire the stunning views, the high mountains surrounding to Phongsaly. In the village, there is also a newly built teas tasting shop which is opened for the guests who want to enjoy the Phongsaly tea on its land. 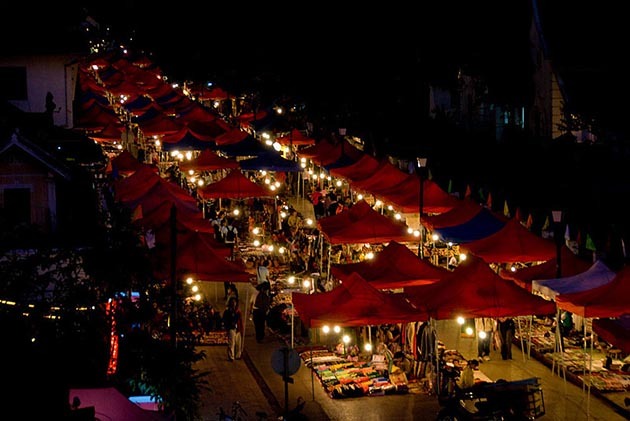 Arrive at Muang Khua, check in your hotel, and enjoy the free time to explore the town. 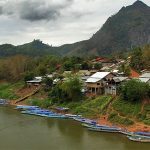 Let the sound of Muang Khua wake up you in the morning, board a private longtail boat for a cruise down one of the most scenically beautiful stretches of river in Laos. Compared to the Mekong, the river is beautiful, yet Nam Ou river is more beautiful and charming than the Mekong. On the way, enjoy a picnic lunch and spot various local villages during the cruise downstream. 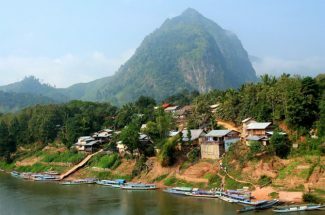 In the late afternoon, reach to the final destination of Nong Khiaw, famed for its dramatic limestone mountains. 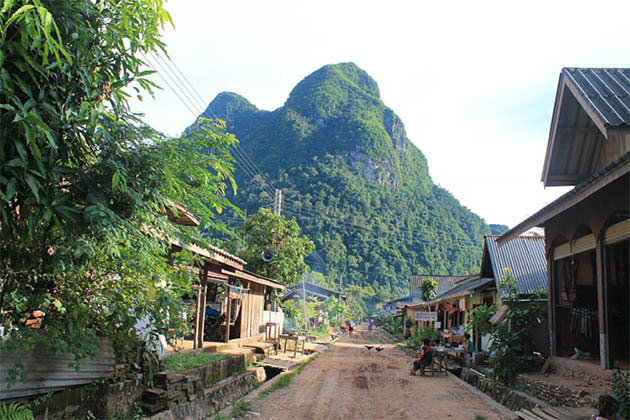 For the adventurers at heart, enjoy a trek up Phou Pha Deang mountain. Take around 2 hours to hike the summit and rewarded with some stunning views of the surrounding landscapes. Enjoy a rest at the top before trekking down to Nong Khiaw. 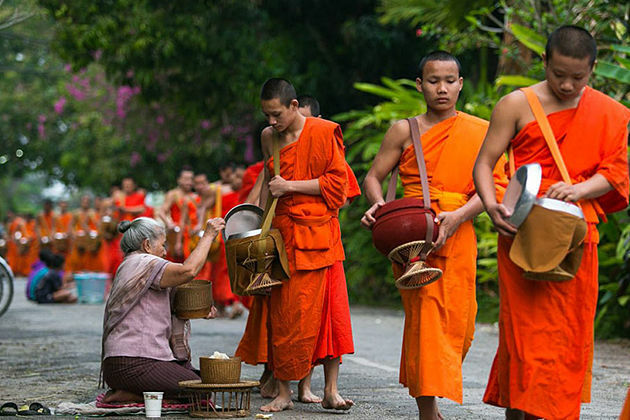 Enjoy the last breakfast in your 9 days tours in Laos. After breakfast, wait for your driver to transfer you back to Luang Prabang. If heading to the airport, a transfer will be provided for the onward flight.